The LTI's "Let's Go!" project enters its 12th year this month. The LTI's "Let's Go!" project entered its 12th year of serving Allegheny County's bus riders this month. Initially developed as a night service for the Port Authority of Allegheny County, the automated information line now provides riders with around-the-clock details about when the next bus will arrive, if it's full and even if it's been rerouted for road construction or a special event. While the proliferation of smartphone apps and online sources for transit information may seem to render such automated phone services obsolete, these resources still remain critical for certain populations, including low-income riders. More than 200,000 users have been served in the project's 11 years in operation. 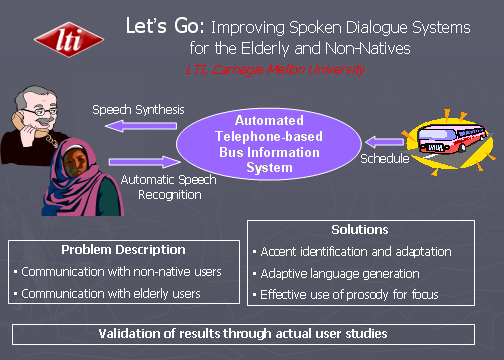 The NSF-funded project was founded in 2005 by LTI Professor Alan Black and Principal Systems Scientist Maxine Eskenazi, and has been an important tool for research into spoken dialogue systems. Let’s Go has generated more than 250 scientific publications, been a key part of 22 doctoral theses and has been a platform for research challenges.